We left Chefchaouen feeling very optimistic about our tour through Morocco. It was such a great introduction to a country that is so rich with culture that we were both excited to see what lay before us. This sense of elation was not to last. Our continuing journey from Chefchaouen south to Fes was an unremarkable 3 hour ride through green fields dotted with farms and the occasional town. 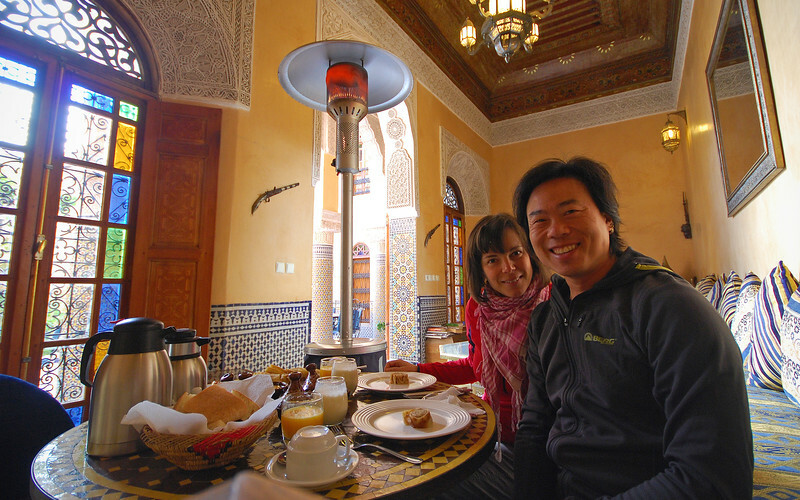 We pre-booked accommodations on the Internet and because our riad was located in the medina (old town), and all of our research indicated that finding these places were very hard to find, I made sure to arm myself with as many maps and GPS co-ordinates as I could find online. 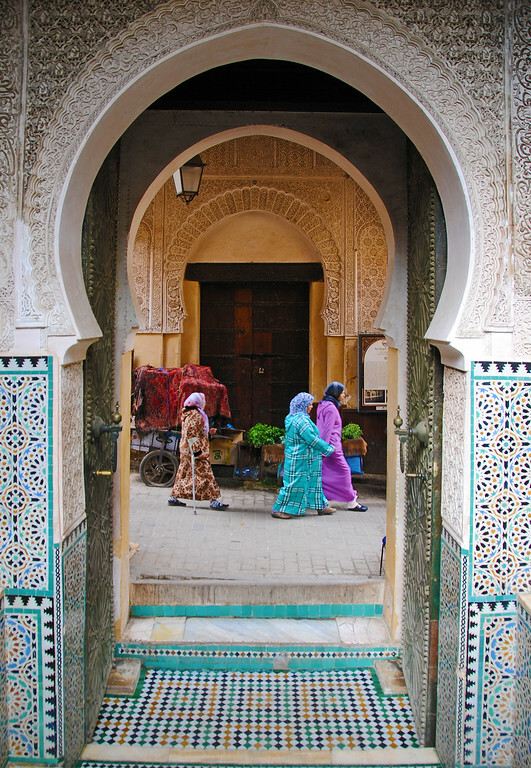 Upon reaching the ourskirts of Fes, a motorcyclist pulled up beside me and struck up a conversation. Normally, I am very friendly, especially with a fellow rider, but my guard was up after reading so many stories of the hustlers in big cities. He made some small talk, and I just nodded. Then he asked me if I had accommodations booked already. There it was: he was commissioned to bring tourists to the hotels. Wow, these hustlers really grab their marks early - we were over 5 kms away from the medina! This wasn't the last of our moto-hustler. Our friend was keeping pace with us *in front of us*, slowing when we slowed, speeding up when we caught up to him. He knew we were headed to the medina and it was obvious he was determined to find out where we were staying. There was nothing I could do about it, I didn't want to delay our arrival any more. We pulled into the large parking area where I thought our riad was located. It was littered with moto-taxis waiting for fares emerging from the medina. I looked around and couldn't find our place. I approached one of the taxi riders to ask for directions and he told me to get in and he would take me to the riad. I declined. All the maps said it was right here. Neda heard the exchange over the radio and told me, "Why did you even bother asking, they're just after our money". I knocked on one of the other riads and someone came out to give me directions to our place. It was right next door! The problem was that we had come up on the back-entrance where the parking lot was and the gates were unmarked. Gah!!!! So much unnecessary hassle and annoyance and irritation. Our host came out to lead our bikes into the parking lot and then helped us carry our soft bags into the courtyard. Before we could even take off our helmets, he announced: "You are welcome! Would you like some mint tea?" Wait, wait... I know the answer to this question! As we got settled in, our host informed us that we had a visitor. Strange? Who else knows we're here? 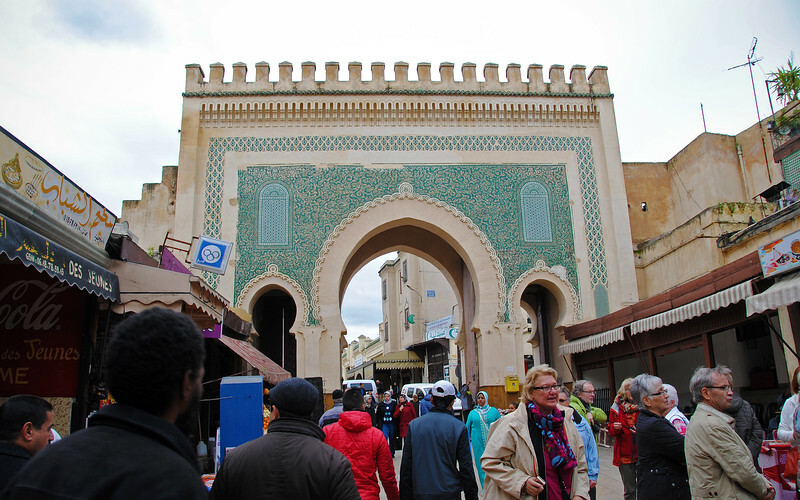 A tour guide introduced himself to us and tried to sell us a guided tour of Fes. We thanked him and told him no. Undeterred, he told us that Fes was the worst city in Morocco to navigate and it was impossible to find our way around the medina by ourselves. 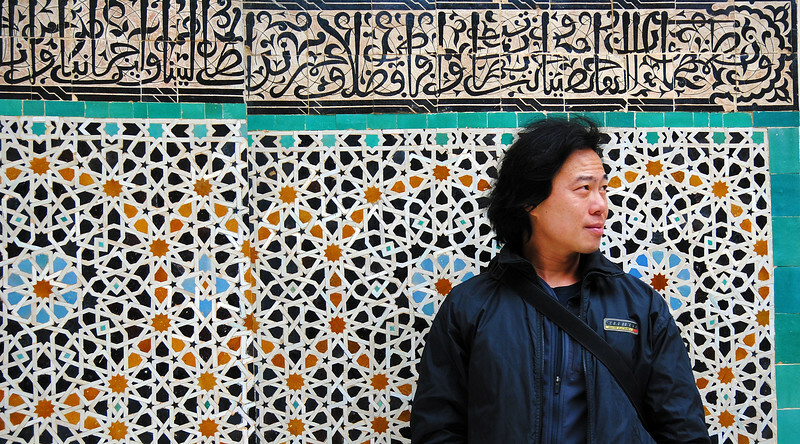 He made it very clear that a guide was the only way to see the old city. We were unconvinced. The tour was too expensive for us so we declined once again. He sold hard, but we stood our ground and he left empty-handed. Our host overheard this exchange and asked us if we knew the tour guide. We shook our heads. Our host told us that the guide had knocked on the front door and told him that two motorcyclists from Canada had asked for him personally. He described us to the host and based on that, he was let in. 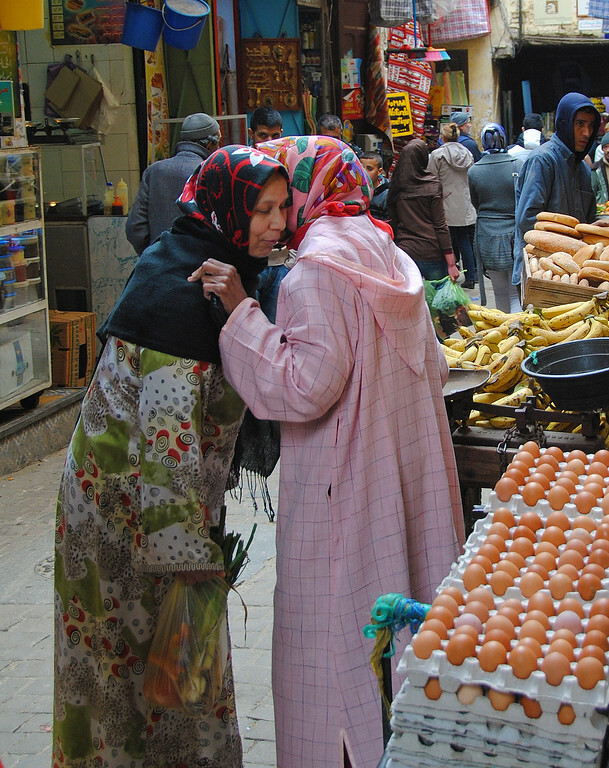 We hadn't even stepped foot outside in the city and I was not liking Fes very much already. That evening, Neda and I huddled together in our room feeling very discouraged and dejected. We had experienced aggressive hustling before in Cuba and didn't deal very well with it - hiding out in our hotels most of the time. 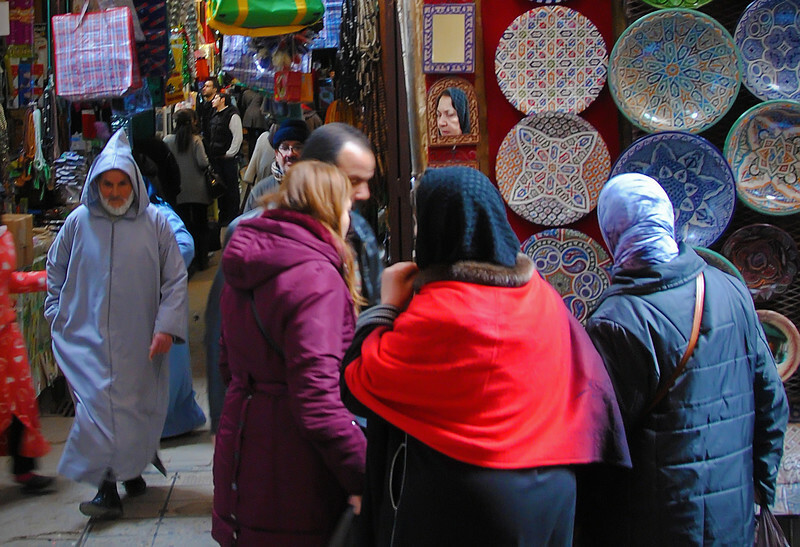 We had to ask ourselves: is this how we wanted to spend our entire time in Morocco? "Snap out of it, Gene and Neda! Look at where you are!" We had to forcefully talk ourselves into an attitude adjustment. Something told me that this was not going to be the last of our self-pep-talks. 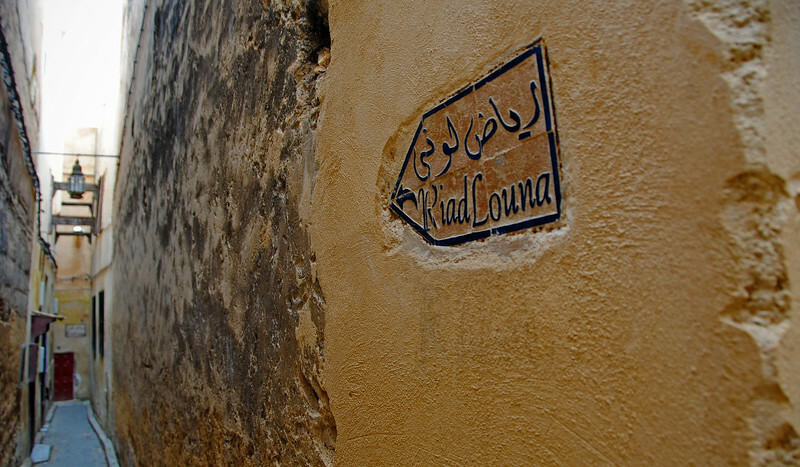 Our riad, which is a Moroccan guesthouse, was a serene and beautiful place. It was quite a contrast to the storm of hustlers that we had experienced on our way in the Fes. Hopefully we would have a better experience in the medina today. Anyway, enough of the rant, the rest of this entry will be just pictures, because pictures are fun. Yay, pictures! Bab means "Gate" in Arabic. Because most of the medinas are walled off, every entrance has an intricately decorated Bab. They are the main attractions in the medinas and are the few things that are well-signed. 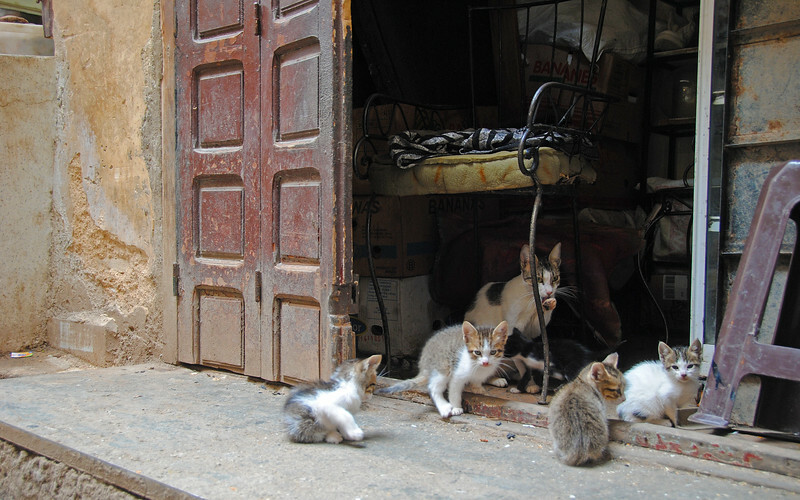 A popular thing for tourists to do is to go around taking pictures of the all the Babs in the medina like they were collecting shirts from Hard Rock Cafes. Although they're neat-looking, personally, I find other things more interesting. 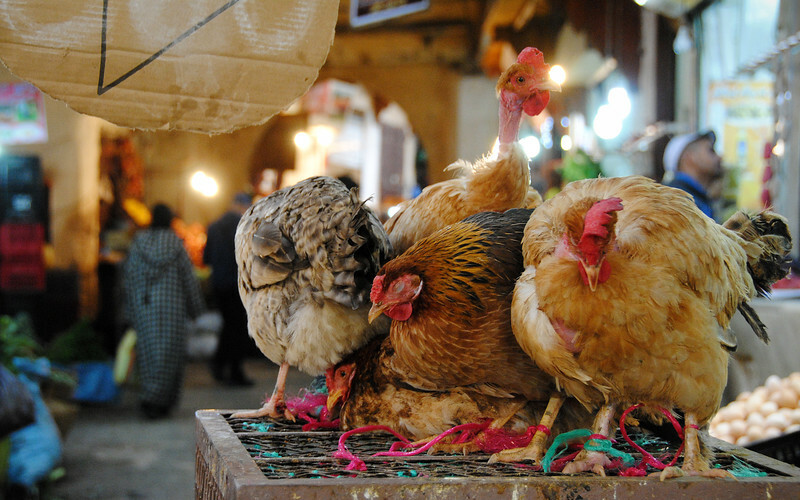 This one chicken woke up when I took a picture of his buddies. Ever wonder where the expression: "Don't risk sticking your neck out" originated from? Resist the temptation, Neda! Resist!!! The roots of veiling in Islam are modesty and decency. Or at least I thought it was...? So far Morocco has been an interesting contrast of old and new. We've seen women wearing full head-to-toe burqas, while most of the younger women only wear headscarves. Even fewer walk around with their hair showing. 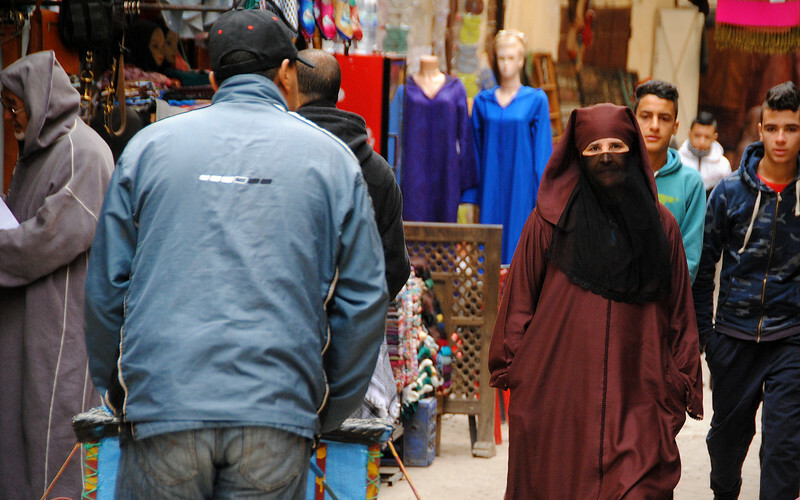 There seems to be a general tolerance for whether womens' heads and faces are covered or not. So far we were doing fairly well in Fes' medina. The streets were unmarked and narrow and were not laid out in any sort of pattern. They were lined with vendors all calling out to us to come take a look at their wares. Every now and then a hustler would ask us if we needed directions, but we declined knowing they would only demand money for simply pointing the way. 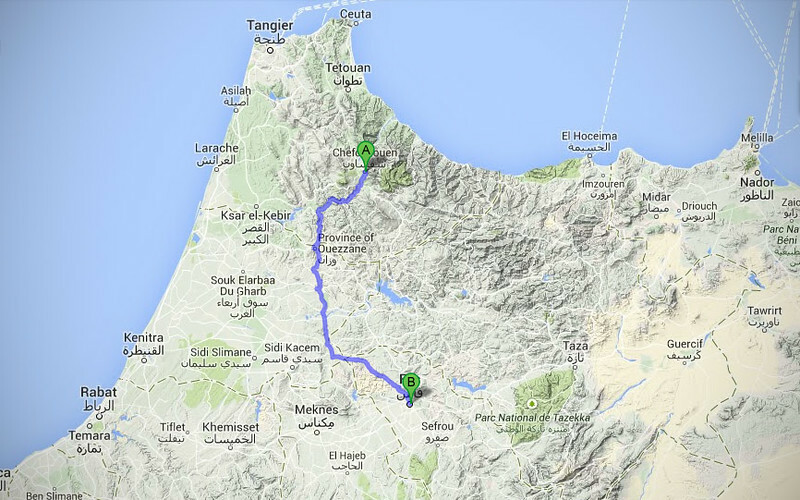 Besides, I had a secret weapon: I had my motorcycle GPS nestled neatly inside my jacket pocket and it was silently tracing our path away from our riad and around the medina. The night before I had programmed all the GPS co-ordinates of all the sights we wanted to see. HAH! Take that, you two-Fesed hustlers! A madrasa is a place of study for the islamic religion. 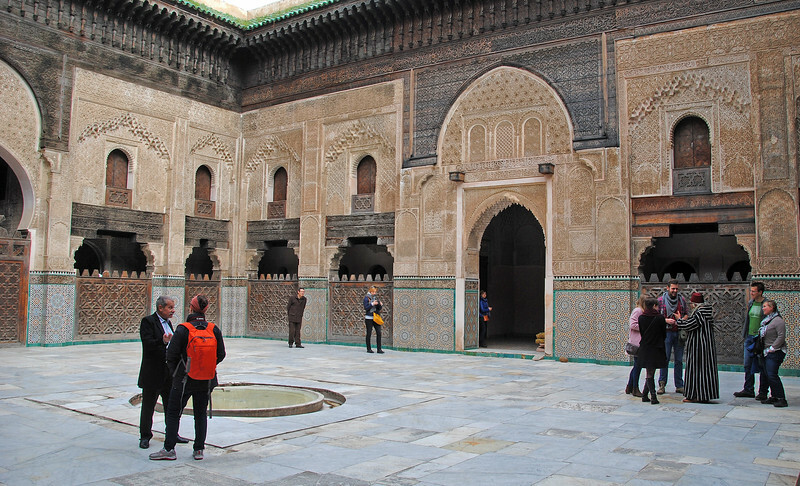 Located right in the heart of Fes' medina, Bou Inania also serves as a mosque. 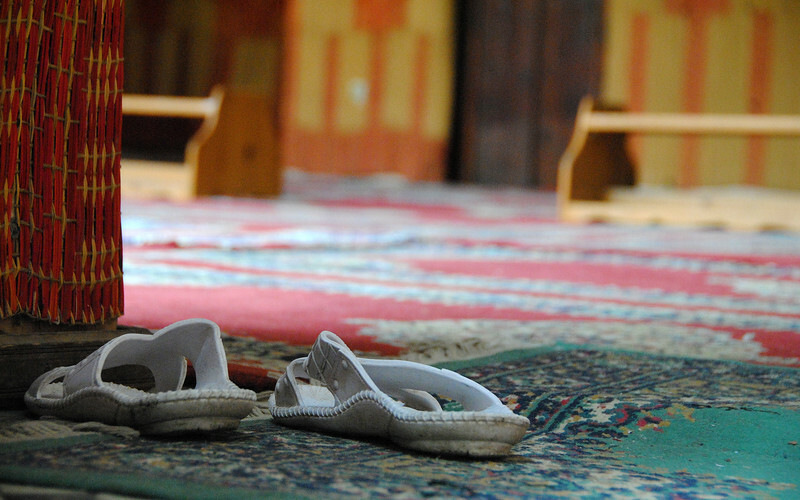 We are quickly learning that any carpeted area in a building is a prayer area and is off-limits to non-Muslims. This just makes me more curious and I try to sneak a peek into these areas any chance I get. is celebrating the 15th anniversary of the exile of the dogs in Fes. 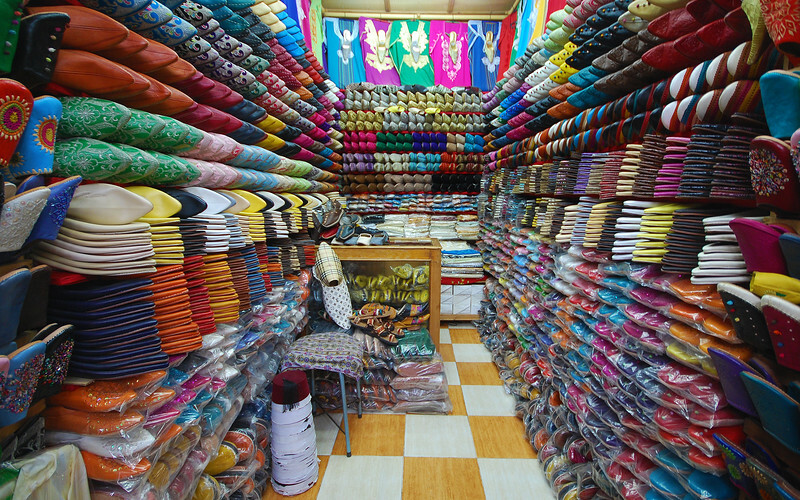 A souk is the traditional Berber word for "market". 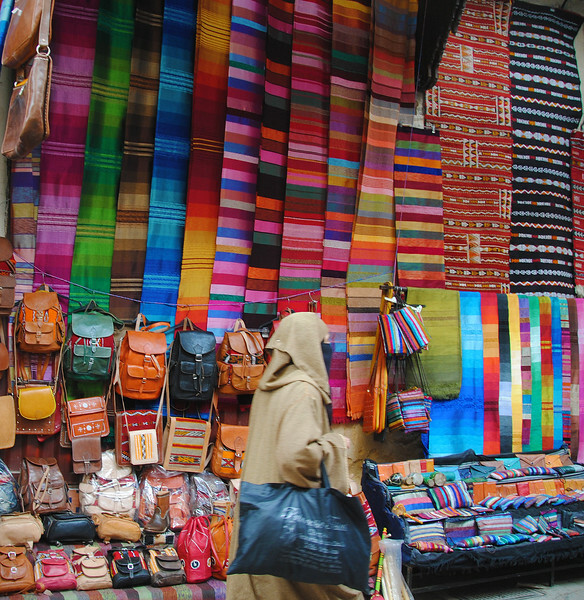 Although the medina is mainly stores, there are people who actually live inside the walls of the old city, and the "souk" is meant to distinguish the areas where the stores are concentrated. 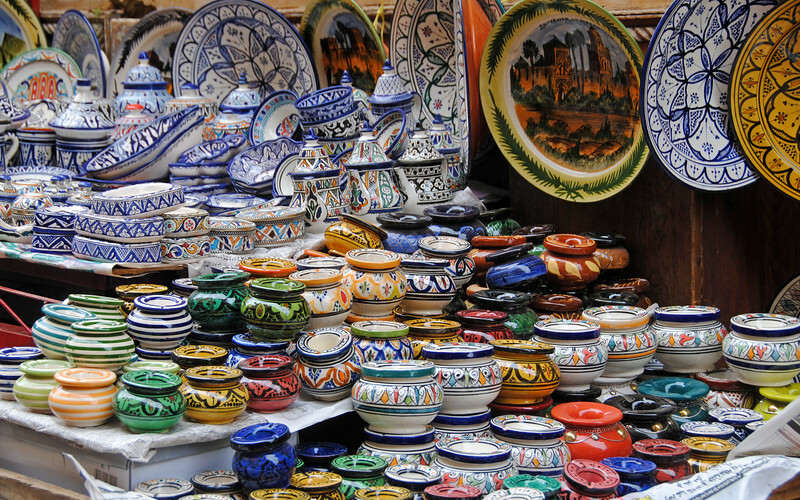 There are many different souks in the medina, some are focused on food, others on clothing and others on pottery and lamps.